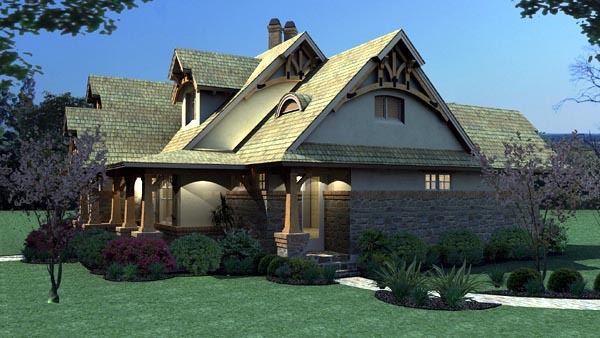 Houzz 294 of our visitors have told a friend about this plan. Question: If I choose to order plans that include the attached garage option, will that increase square feet of living space? Answer: Yes, slightly. It adds approximately 30 SF to the utility. Answer: The trusses are a custom item. Question: are any of the ceilings vaulted? Or is it a standard flat ceiling throughout? Answer: Ceilings are 10’ flat everywhere but the master suite which has a stepped ceiling to 11’. Answer: he steps going down from the foyer would go away and become a closet. Answer: Our plans include details of the exterior arches. We show the bonus option as standard in our plan with no interior trusses. Question: If you don’t build the basement, do those stairs leading to the basement go away in your plan? Does fireplace shift to bedroom wall if basement stairs are gone? Just leaving back stairs on the other side of fireplace to bonus room? Answer: he stair also serves as access to the bonus above. So the fireplace stays where it is. Question: with the attached garage plan, is there enough room (height) above the garage to add a bathroom and studio bedroom? Answer: Yes, there is about 12’ of width(5’ tall sidewalls) x the length of the gable(24’). Only thing that needs to be figured out is stair location. Question: Getting ready to purchase lot and wondering the front footage of house plus detached garage at an angle as shown in picture? Answer: In the rendering, we have about 92’ total width. Question: What is the ceiling height on the main floor? Question: Do you know where we might the material for the arches shown or are they custom made? Answer: They will have to be custom made by a timber truss company. Question: Hello, Just wondering how much higher the house would have to sit if this was not a walk-out basement but just a regular? could you still make the front entrance "level" with ground? Answer: You would need a minimum of 8” clearance below the bottom of the basement wall for drainage. That would mean about 1’-8” from finish grade to finish floor on the high side. Answer: Those are the outside dimensions. Its not a rectangle shape either, there’s lots of ins and outs. The heated area is calculated from the outside face of the exterior walls, following the perimeter. We do not have room by room SF’s. You can get a rough idea though by using the numbers labeled on our floor plans. 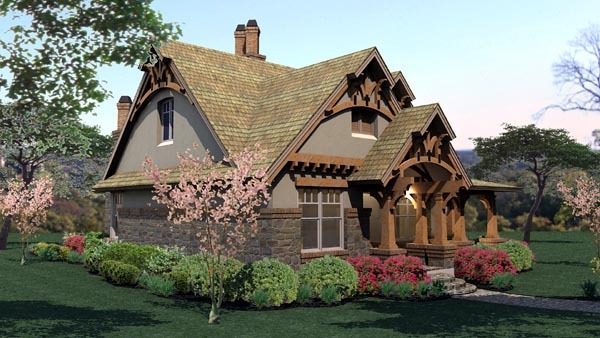 Question: I love this plan and I am excited that it is available with a walkout basement. However, our property slopes with the high side at the back of the house and the low side at the front of the house. 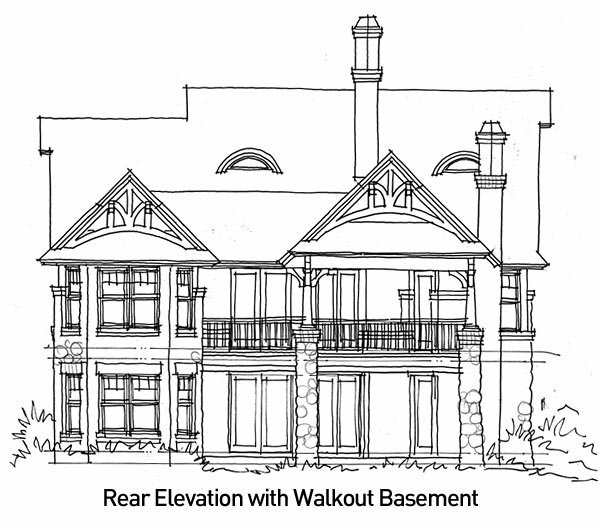 Is is possible to have the walkout basement be at the front of the house? Answer: I guess it possible but not very practical for this particular design. A two story design with living areas on the lower level might make more sense. 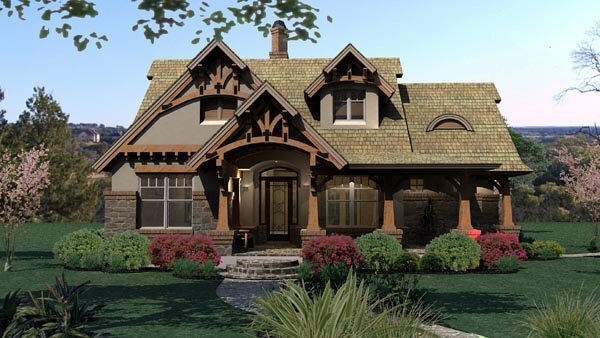 Question: PLan 65870, this plan has exterior gable moldings. Is there a company I can buy them from if we purchase these prints? Answer: We call those out to be cut from cedar but there is a company called ‘Fypon’ who can make those in molded millwork. Answer: The attic over the garage allows about a 12’x22’ space that has 5’ tall side walls. With a 12:12 pitch that’s pretty easy for the average person to stand up in. The only thing you have to work out is a stair. Answer: Yes. The lot would be best if it slopes away perpendicular to the back of the house. Answer: Yes, that option is already available. See Elevation B. Answer: Metal roof would work fine on this house. Our drawings show a 2’ above finished grade finish floor. If you need a 4’ high finished grade, there would have to be a modification to the drawing for a fee, but its an easy change. Question: Do you have any interior pictures of this plan of a real build? Is it a possibility to relocate the kitchen to where the spare bedrooms are located giving extra room for master and relocating stairs where kitchen is? Answer: Those are some pretty extensive modifications, but it could be done. Question: can you tell me what the total sq footage of the windows is? Answer: I’m sorry, we do not have that number readily available. Question: Does this floor plan come in a slightly larger size? Answer: Not at this time, no. Answer: They are 12x12 at the base and tapered to 8x8 at the top. We’re calling them out as rough sawn cedar. Question: What is the sq. footage of the basement shown? Answer: Yes, the heated area is calculated to the outside face of stud which is the same area for 2x4 or 2x6. A third bay could be added in front of the garage that would project about 11’ or 12’ forward, almost inline with the front porch. Adding a toilet closet and doubling the size of the existing tub into a shower would add approx. 30-50 SF. Easily under 1550. Question: what is the height of the finished floor above grade? Answer: That will depend on your site. I would recommend a minimum of 8” above grade on the high side. Question: What material is used in the siding? Question: With foundation on slab I'm not sure how it would look without stairs. I don't see this version shown. If we order this plan with attached garage and on slab will the plan drawings reflect this option. Thanks! Answer: If you are referring to the steps to the porch, they will be a function of how how the slab sits above grade and can be manipulated to raise it up if you prefer. The attached garage version does include a slab option as part of it. Question: My Wife and I are very interested in the floor plan with the attached garage! We would be ordering the walkout basement foundation BUT we want the basement unfinished. What would the total living area square footage be with the garage and unfinished basement? Answer: We show 1421 SF of First Floor heated area. The basement area could be as high as another 1421 SF +/- depending on how much of it you wish to use. The garage is 600 SF. 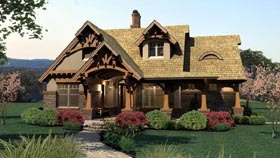 If you’re calculating covered area, don’t forget 248 SF of Front Porch and 314 SF of main level Lanai. Question: If we don't go with the upstairs are the ceilings vaulted or is it attic? Answer: We show it to remain attic, however you could easily modify this with your builder/carpenter in the field. Question: Do you have any interior pictures of this plan? 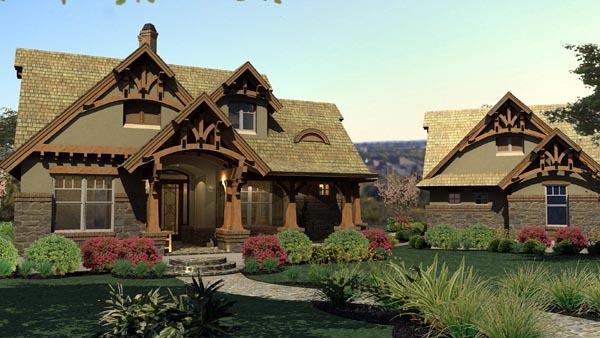 Question: do you have a house with same floor plan but not as craftsman? 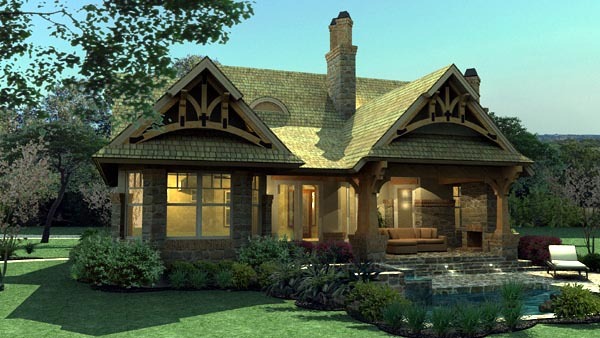 Question: is the bonus area 504 sq ft and the porch of 562 sq ft included in the 1421 total living area sq ft? Question: How tall/deep is the crawlspace (crawlspace version) and which side of the house does the attached garage version attach to? Question: Looking at the front elevation picture, a max ridge height of 25'9" seems high? Is that because it includes a slightly above-grade basement/crawl? From the picture I would guess a max-ridge height of maybe 22'? Answer: It is 25’-8 1/4” from the finish floor to the top of the main ridge. 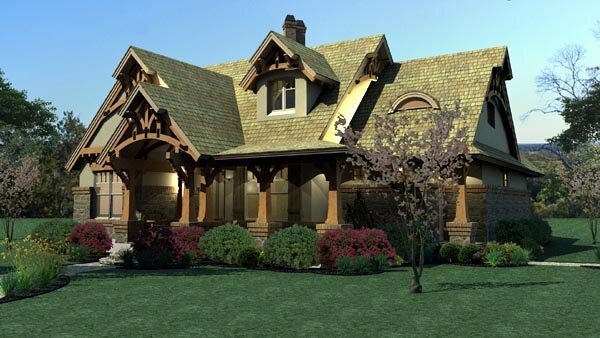 Question: i am about to buy the plans for this house from you i am doing a preliminary construction cost analysis ,what is the roof material and what kind of wood are the decorative trusses made of ? 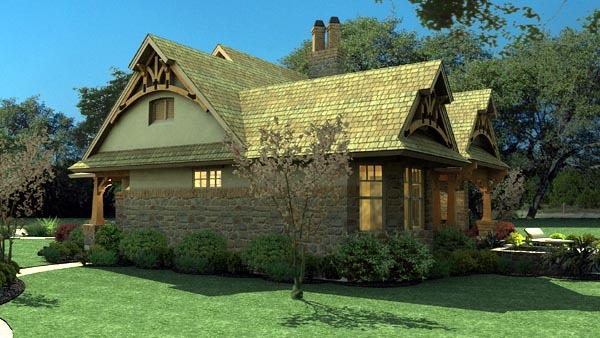 Answer: Our rendering shows shakes for the roof. I’d recommend a 300# comp shingle though with a thicker edge(timberline). 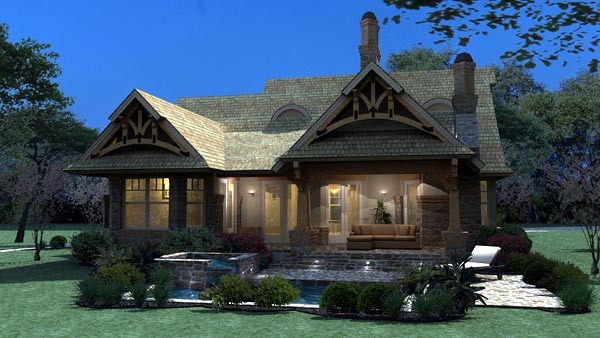 The trusses would ideally be cedar. Question: Do you have photo of this plan with garage attached? Question: What is the sq. ft for home with garage. Answer: The garage is not part of the heated area. The garage is 24’x24’ or 576 sf. The heated area of the home is 1421 sf. Question: Beautiful plan! Does the garage plan include the 2nd floor as depicted in photos? Is it a loft like area on the interior? Lastly, do you know if anyone has connected the garage to the house plan? Answer: The space above the garage is just attic but could be a loft if it had stairs. We will have an attached two car side loaded version in about 2 weeks. Question: Customer wants to know if structural plan, all four elevations, sections, and window schedules are included with the package sets? Answer: We include a foundation plan(slab, crawl or basement), framing plans-stick framed(floor, ceiling and roof) indicating size and placement of joists, rafters and beams, one building section, all four elevations at 1/4” scale. Door and window sizes are labeled on the floor plan at each location on the plan rather than in a door/window schedule for clarity. Flipping back and forth from a schedule just causes mistakes. Question: What happens to the first floor Lanai when you have a walk out basement? Answer: It becomes a raised deck with a lower level porch as well. 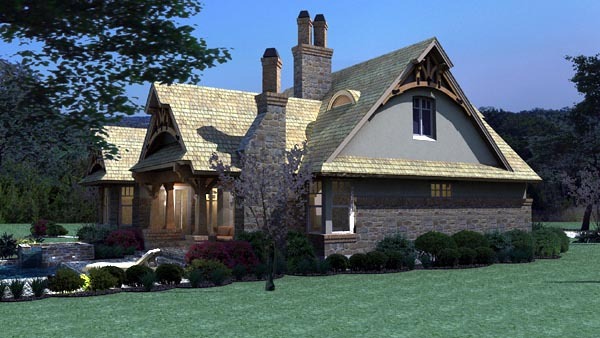 Question: Has this house plan been built anywhere in Michigan? Answer: We do not maintain that kind of info. Question: I see the total living area listed as 1421. I'm assuming that it doesn't include the lower level of the walkout. What is the square footage of the lower level? Answer: The lower level is 988 SF finished. Answer: The rafter sizes would need to be enlarged as well as the spacing decreased. This would take care of any increased loads. Local framers would need what the standard size and spacing required would be. Question: Is the second floor plan for an upstairs and if so would the stairs go up where the plan shows going down into the basement? Answer: The stair up to the bonus area is on the back of the fireplace and goes in the opposite direction as the stair to the basement. Question: can you email me pictures of the interior? Answer: None available at this time. Question: what square footage is the garage? What we would want to do is have an efficiency space in upper area of garage. Let me know total square footage please. Question: Do you have photos or graphic designs of the interior of the home? Please post them if possible. We love this home. Question: do you have photos with basement? Question: If we purchase this plan with the crawlspace foundation, where is the water heater and furnace placed? Answer: The attic is where we locate mechanical equipment. A fiberglass pan with a drain under the water heater makes it safe. Click Here to download a free PDF Brouchure of Plan Number 65870. Call to order the following options: 2 car garage to be attached for $250. We also have a 3 car side loaded version as well as a front loaded version for $250.